Have you ever thrown a party so good that the skies part and the snow falls? Well, OvR is proud to say that last Thursday we did just that! 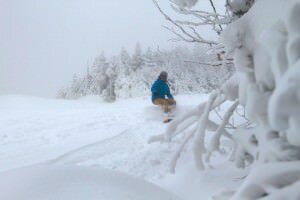 Not only did we get a little snowfall on Thursday (Stratton, Mt Snow and Killington all reported between 3 to 5 inches!) but we managed to get Mother Nature to dump another 6 inches last Saturday! In fact, Killington is now officially open! So what did we do to earn so many snow karma points? Simple, Skate Brooklyn and OvR gave away 3 snowboards! 1. 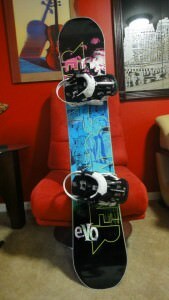 First our friends at The L Magazine, gave away a board to Kevin G.
2. At the Party on Thursday, Pete Kocher, owner of Skate Brooklyn officiated the “Flat-Land-Butter” contest. First place winner, Simon, won a Forum Scallywag snowboard set up courtesy of Skate Brooklyn. The runner up, Fred T, received a free day trip to Hunter Mountain from OvR. But everyone who entered went home with some goods. Other Raffle winners received snowboard jackets, pants and other gear. The best News is it’s not over yet boys and girls! Skate Brooklyn has decided to extend their Winter Stoke Sale through this week in celebration of the stoke! Head over to Skate BK for markdowns on the new 2011/2012 gear as well as on huge discounts on the sale items from 2010/2011. Keep an eye out also for more events, giveaways, movie premiers and fundraisers coming up …. Remember snow karma goes a long way! Friend and follow us so you can get up to the minute updates on Facebook and Twitter!